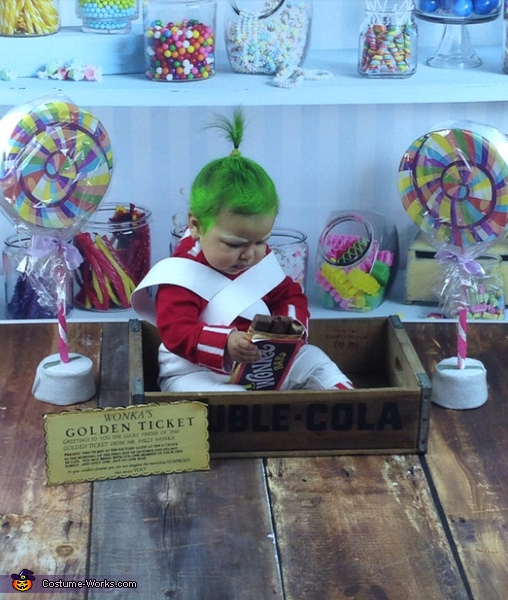 MY DAUGHTER IS WEARING A RED AND WHITE OOPMA LOOMPA COSTUME. MADE FROM AN OLD PAIR OF SPANDEX, TWO PIECES OF ELASTIC,RED BUTTONS,A TURTLE NECK, FELT. This is the best costume I've ever seen for a baby girl! So Adorable!! Great Ideal. I absoluetly love, love it! Wow!!!!! !...that is too cool. Looks just like the movie. Plus, she is adorable. Adorbs!! Best costume for a baby!! Oompa loompa doompa dee doo, I got another riddle for you...... Lol! Baby girl looks adorable! Awesome!